Viscosity modifiers can be added to injection solutions to improve amendment distribution in the subsurface. Shear-thinning fluids of polymer solutions have variable viscosity, helping facilitate a more uniform distribution of injected amendments to different permeability zones while maintaining low injection pressure. Specifically for particulate amendments, viscosity modifiers can help maintain particles in suspension and improve the radial distance of particle injection. Colloidal silica also has shear-thinning properties and can be used to deliver slow-release amendments to the subsurface. The success of in situ remediation technologies rely on the effective delivery and distribution of the remedial amendments (e.g., electron donors, oxidants, microorganisms, etc.) to the target zones. Formation heterogeneity (e.g., differences in permeability) is a common challenge due to preferential flow during the injection, causing a non-uniform distribution of injected amendments. When particulates are used as remedial amendments (e.g., zero valent iron (ZVI) or slow-release amendments), gravitational settling of the particles within the sediment pores can limit distribution. Viscosity modifiers can be added to injection solutions to improve amendment distribution in the subsurface and can help maintain particles in suspension and improve the radial distance of particle injection. Viscosity modification can also be used to slow the migration of slow-release amendments out of the target treatment zone. Figure 1. Xanthan gum concentration influence on fluid viscosity and rheology for several xanthan concentrations. All solutions were made in de-ionized water. Soluble organic polymers, such as xanthan gum, can be added to water to form shear-thinning fluids that have a high viscosity at low shear rates (Fig. 1). However, the fluid viscosity declines as the shear rate increases during mixing or when the fluid flows through porous media. This effect keeps injection pressure low while providing the benefits of higher viscosity fluids. These shear-thinning fluids can be used to more uniformly distribute remedial amendments. When first injected into a heterogeneous formation with both higher and lower permeability (K) zones, the shear-thinning fluid preferentially migrates through the higher K zones. However as the fluid migrates radially out from an injection well, shear rates decline with increasing distance, and back pressure increases, forcing more of the shear-thinning fluid and remedial amendment into lower K zones. 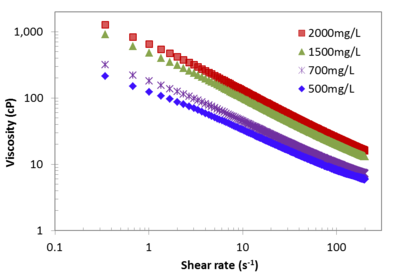 Use of shear thinning fluids improves the uniformity of amendment distribution around an injection well, for moderate contrasts in hydraulic conductivity of less than about 2 orders of magnitude. 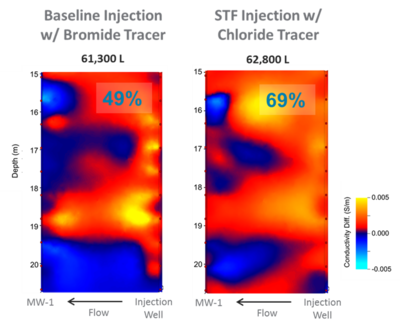 In Figure 2, each panel shows the distribution of a high electrical conductivity injection solution (red/yellow shades) solutions for a baseline (no viscosity amendment) injection (left panel) and shear-thinning fluid (STF) injection (right panel) over the depth interval of the screen. After the amendments are delivered to the target zones, the polymers are degraded and the viscosity of injected solution returns to that of groundwater. Enhanced delivery and improved distribution uniformity for soluble bio-nutrients and oxidants have been reported in the literature. Enhanced delivery of vegetable oil droplets using xanthan gum solution has been tested and promising results are documented. Figure 2. Comparison of amendment distribution using electrical resistivity tomography (ERT) images. Micron-sized zero valent iron (mZVI) particles can be used to remediate a range of groundwater contaminants. Compared to nano zero valent iron (nZVI) particles, mZVI particles have longer life time and are easier and safer to handle during preparation. However, mZVI particles settle quickly in water, making the preparation of stable particle-in-water suspensions, injection, and distribution of the particles to the subsurface unpractical. To address this issue, polymers can be added to a mZVI-water suspension to significantly increase the fluid viscosity, slowing the sedimentation rate of the particles. With viscosity modification, the mZVI suspensions can be effectively prepared and injected into the subsurface to distribute mZVI to a distance from the injection well for use in site remediation. Xanthan gum, SlurryProTM, and guar gum are examples of polymers that have been used for mZVI stabilization. Because these polymer solutions are shear thinning fluids, with injection-induced shear, the viscosity of the solutions is lower near the injection well, reducing injection pressure buildup. Remedial technologies intended to last for a long time and release the amendment at a slow rate are useful for some groundwater remediation sites. Solid phase permeable reactive barriers have been the conventional approach to place slow release amendment materials in a particular location in the subsurface. Installation of these barriers by trenching can be difficult for some sites (e.g., for deep sites). Aqueous colloidal silica suspensions have low viscosity initially; however, their viscosity increases with time and eventually they become gels. Under favorable geochemical conditions, these delayed gelation solutions allow time for injection and distribution into the desired location in the subsurface. This material can be used to prepare injectable amendment-laden silica suspensions. After injection to the target zones, the suspensions become gel and establish discrete slow release remediation sources in aquifer. Aqueous silica suspensions also have shear thinning characteristics, facilitating their injection.